The former garda press officer was savaged by Mr Justice Peter Charleton in his report. THE DISCLOSURES TRIBUNAL has found that former garda press officer Superintendent Dave Taylor “chose to present a public lie to the people of Ireland” over missing phones that would show evidence of a smear campaign directed by senior gardaí against Maurice McCabe. Taylor had claimed that former garda commissioner Martin Callinan had sent him text messages that could be used by the press officer to smear McCabe to journalists. He also claimed he would keep then-deputy commissioner Nóirín O’Sullivan abreast of developments with the smear campaign. Both of these claims were found by Mr Justice Peter Charleton to be “false”. Independent analysis was conducted on phones used by the key players during this period, and little was found to support Taylor’s claims in this regard. Taylor, however, would later withdraw the allegation that such evidence existed on the phones to back up his claims, despite him having told Maurice McCabe in a private meeting at his home that it was the case. “Having made this dramatic allegation, the tribunal had to spend time and money investigating it,” Mr Justice Charleton noted. “That obligation continued even though Superintendent Taylor later withdrew the allegation in an interview with the tribunal investigators. But, the reality remains that he made that allegation and he had the same motive for doing so as with the other allegations he made: his own self-interest. Taylor was moved out of the garda press office shortly after Callinan’s resignation in March 2014. The following year, he was arrested and suspended for allegedly leaking information to the press. He was still suspended when he made his protected disclosure containing the allegations he was directed to conduct a smear campaign against McCabe by Callinan. Taylor alleged phones “behaved mysteriously” and went missing because they had evidence “implicating the highest levels of the national police force in a vicious campaign against a defenceless sergeant”. And the reality? 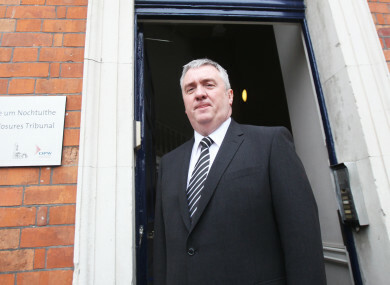 This tale was spun about missing phones, telecommunications interference by Garda Headquarters, texts to politicians and journalists and a trail of evidence that never existed in order, specifically and deliberately, to destroy the investigation by Chief Superintendent Clerkin into the behaviour of Superintendent David Taylor. At risk through a perfectly legitimate and honest investigation by a police officer of high intelligence and of truly distinguished record, Superintendent Taylor chose to present a public lie to the people of Ireland. It was enthusiastically taken up. Furthermore, it cast a pall of pretended deceit over the entire police force. Then no one knew better. Now, they do. Email “The missing phones: Tribunal finds Dave Taylor 'chose to present a public lie to the people of Ireland'”. Feedback on “The missing phones: Tribunal finds Dave Taylor 'chose to present a public lie to the people of Ireland'”.